Solar panels provide 1kW of charging power. The mixer shower stands over a full sized bath. Two porta potties are included with the sale. 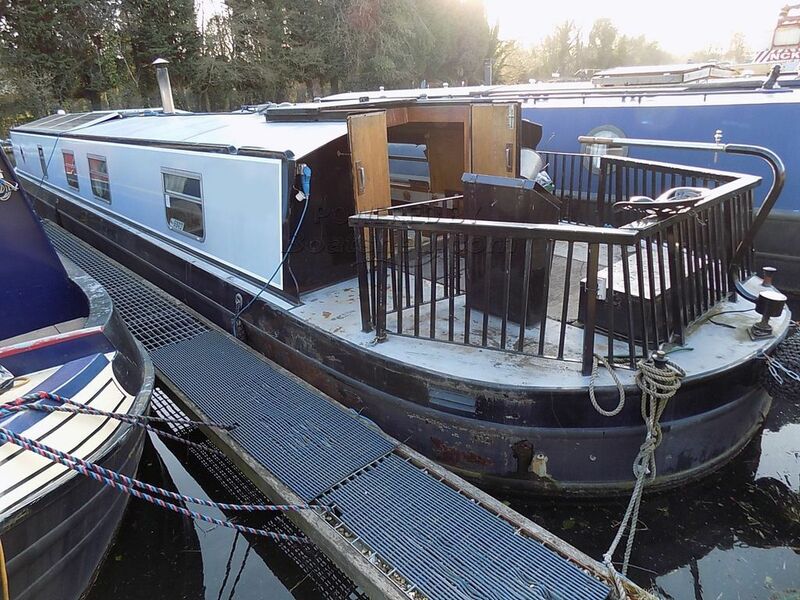 Your chance to own a very reasonably priced Collingwood Widebeam canal boat. This boat has a practical and adaptable layout with the galley immediately below the companionway leading to a good sized saloon area with a central multi-fuel stove that was new in 2017. Beyond the saloon is an open dining area that could easily be converted to a second cabin. The heads is large with full-sized bath, shower , basin and two porta potties. Forward still is the master cabin with double bed and full height wardrobes. Access through double doors to the well-deck. BSS certificate is current until June 2018. The last survey is dated December 2014. This is a boat that is likely to sell fast with it's adaptable layout and attractive price. This is the ideal live-aboard boat. The boat is currently located at a canal-side marina on a leisure mooring that may be available to the new owner. This Wide Beam 57ft Cruiser Stern has been personally photographed and viewed by Richard Thompson of Boatshed Grand Union. Click here for contact details.